Summer in Shanghai heralds the arrival of bountiful local fruits like lychees (荔枝), longans (龍眼), peaches, and yangmei (waxberries 楊梅). Street vendors hawk them from overflowing bamboo baskets, which they carry on poles balanced on their shoulders. They are a welcome, yet increasingly rare, sight in modern Shanghai as urban life whizzes by. Although I’m not adept at the art of bargaining I would always try to get the best deal from the vendors. It simply is part of commerce in China. After successfully negotiating a purchase I would bring my fruits home, chill them and serve them at the end of dinner. But this is not the only way to enjoy these summer fruits. Cooking with fruits is a long-standing tradition in Chinese cuisine. 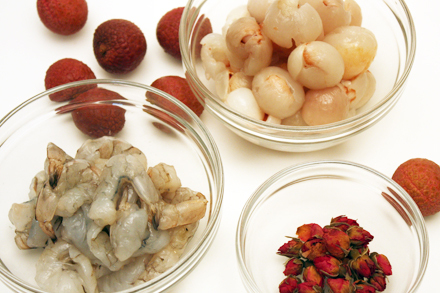 In particular lychees, which hail from the land of Cantonese cooking, are often found in Cantonese stir-fries. They can be used to accompany chicken, shrimps, pork or beef. You might expect these combinations to produce some of the most refreshing dishes for the summer. But lychees, as it turned out, are considered to have a yang property according to the Chinese food therapy philosophy. Because of this tendency to increase body temperature they are unsuitable for summer consumption. However there is a remedy. 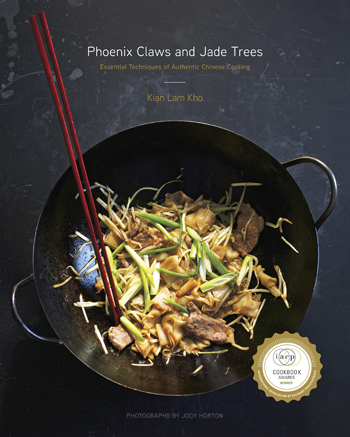 I am going to share with you a recipe that makes use of lychees, yet includes an ingredient to balance the yang character. This ingredient is rose tea, which has a yin or “cooling” affect. Rose tea, often used in iced tea drinks, is perfect for reducing the yang energy in lychees. 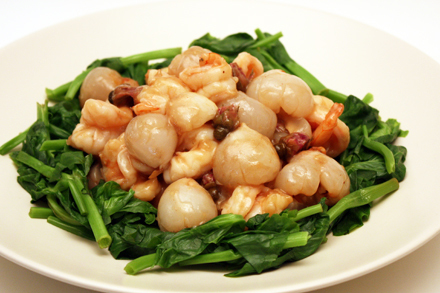 The recipe is Rose Flavored Stir-fried Shrimp with Lychees. 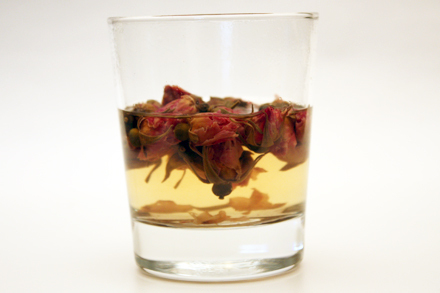 Rose tea is an infusion made from dried rosebuds. They are usually paired with green or other herbal tea. The rosebuds impart a faint fragrance to the tea that can be very intoxicating. In this recipe the rose aroma complements the sweet flavor of the lychees in a very subtle way. Fresh lychees should be used in this recipe because the fresh fruit taste should still be evident after they are lightly cooked. For years canned lychees were the only way Americans got to taste this fruit even though Florida farmers have cultivated them for many years. But recently there’s been an increase in production and improvement in transportation. Ethnic Asian markets in major U.S. cities now sell large quantities of fresh lychees in the summer. In New York Chinatown the season starts at the end of May, peaks in the beginning of July and ends at the beginning of August. So don’t wait any longer before you try to make this dish since lychees are only in season for a few more weeks. Steep the rosebuds in the boiling water for about ten minutes and set aside to cool. In the meattime devein the shrimp then add all the marinade ingredients and mix well. Let the shrimp marinate for about 20 minutes. When the rose tea is cool add all the other sauce ingredients and mix well leaving the rosebuds in the sauce mixture. Bring a pot of water to a boil and add the pea shoots. Blanch the vegetable for about 30 seconds and drain immediately. Arrange the vegetable in a ring on a round serving platter leaving a space in the middle for the shrimp and lychees. Heat the vegetable oil in the wok until just beginning to smoke. Add the shrimp and stir-fry for about one minute or until the shrimp is about three quarters done. Remove the shrimp from the wok and put in a bowl leaving about one tablespoon of oil. Add the garlic and ginger to the oil and stir-fry for about one minute. Add the lychees and the sauce ingredients. Continue to stir-fry until the sauce is thickened. Return the shrimp to the sauce and mix well. Stir-fry for another minute or so, then scoop everything into the middle of the serving dish. If you or any of your guest are allergic to shrimp then substitute it with sliced chicken breast. Very nice combination of textures, flavor and color. Inspirational. I’ve never had lychees in any way except as a desert served in ice. am allergic to rose hips so think I would be alergic to rose buds. can I make this without the rose? Is there anything else to sub? otherwise the recipe sounds terrific and would love to try it. Yes, you can make this dish without the rose buds. It’ll still be delicious!